Philadelphia, PA – [May 3, 2017] – Janney Montgomery Scott LLC (“Janney”), a leading full-service wealth management, financial services and investment banking firm headquartered in Philadelphia, Pa., announces the expansion of talent on its Fixed Income and Mortgage Trading desks with the addition of nine industry professionals thus far in 2017. 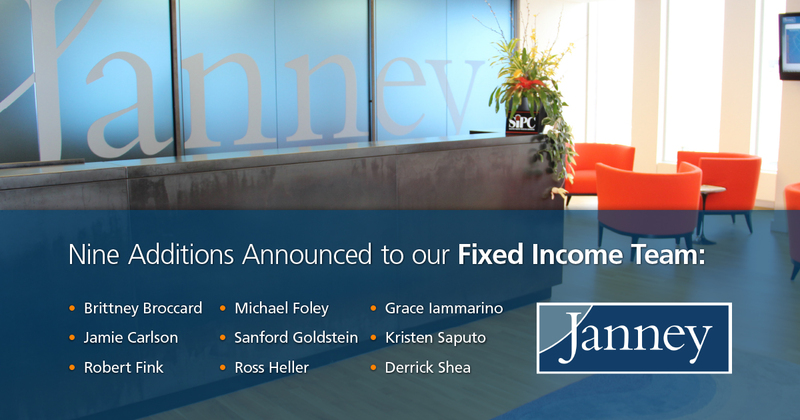 Brittney Broccard, Jamie Carlson, Robert Fink, Michael Foley, Sanford Goldstein and Ross Heller all joined Janney’s Fixed Income team. Additionally, Janney added a Mortgage Pipeline Hedging Trading group with the addition of Derrick Shea, Kristen Saputo and Grace Iammarino. They join to strengthen the firm’s existing suite of mortgage related trading expertise. The announcement of these nine individuals comes on the heels of the promotion of four leaders across the firm and demonstrates Janney’s commitment to strengthening its expertise with top professionals in the business. Brittney Broccard joined Janney’s Fixed Income Sales team in the CD/Structured Products group from Edward D. Jones, where she worked as a CD and Rates Trader. Jamie Carlson, formerly with CL King & Associates, joined Janney as a Director. With over 30 years of experience in the fixed income market, he has held a variety of Sales and Management positions throughout his career. Carlson’s former colleague at CL King & Associates, Robert Fink, also joined Janney as a Director. He previously held Sales positions at Mesirow, Cantor, RBS Greenwich Capital and Barclays. Michael Foley joined Janney from INTL FC Stone/GX Clarke as a Director in the firm’s Securitized Sales group. Sanford Goldstein joined Janney from CapRok Capital as a Director in the Securitized Sales group. Previously, Sanford held positions at DLJ and Kidder Peabody. Ross Heller, formerly with Bay Crest Partners, joined Janney as a managing director in its securitized sales group. Previously he held Sales, Trading and Structuring positions at RBC Capital Markets, Nomura, JP Morgan and Merrill Lynch. The three additions to Janney’s mortgage trading expertise all joined Janney from Atlas One Financial. Derrick Shea joined as Managing Director of Fixed Income Trading, Kristen Saputo joined as Director of Fixed Income Trading, and Grace Iammarino joined as Fixed Income Trading Associate. “Derrick, Kristen and Grace will be adding value to the Janney Fixed Income mortgage team immediately, helping build upon our already strong platform and contributing to client success,” shared Tom Bajus, Managing Director and Head of Fixed Income.